Average citizens see a revolution coming in the workplace, and they are concerned. As a new Pew Research Center study of public opinion in 10 countries highlights, there is a widely shared view that the nature of work will likely be transformed over the next half-century, though not everyone is equally convinced. In some countries and economic sectors, of course, the transformation of the workplace has already begun. In South Korea, there are more than 600 installed industrial robots for every 10,000 workers in manufacturing facilities. In Japan there are more than 300 and in the United States nearly 200. Profit maximization, and the relatively high cost of human labor, helps drive automation. The average hourly cost of a manufacturing worker is $49 in Germany and $36 in the U.S. The hourly cost of a robot is $4. How far will the use of computers and artificial intelligence spread? The Organization for Economic Cooperation and Development (OECD) estimates that 14% of jobs in advanced economies could become susceptible to automation and another 32% substantially changed, affecting the lives of millions of workers. In all 10 advanced and emerging economies polled, large majorities say that in the next 50 years robots and computers will probably or definitely do much of the work currently done by humans. In three countries – Greece, South Africa and Argentina – four-in-ten or more believe this will definitely happen. And most believe that increasing automation will have negative consequences for jobs. Large majorities in each nation surveyed think ordinary people will have a hard time finding jobs as a result of automation. 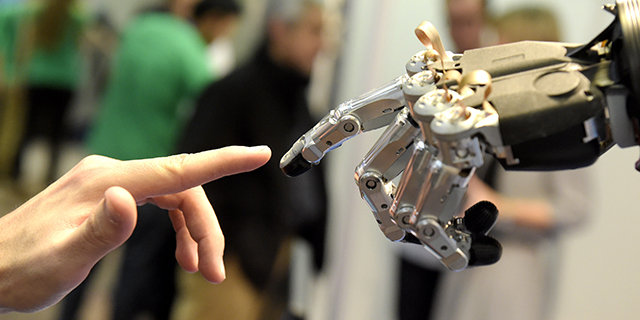 Relatively few predict new, better-paying jobs will be created by technological advances. Publics believe the responsibility for dealing with these challenges should be widely shared across key institutions and actors in society. Most tend to say that governments, schools, individuals themselves and, to a somewhat lesser extent, employers all have a lot of responsibility for ensuring that workers have the right skills and education to be successful in the future economy. These are among the key findings of a Pew Research Center survey conducted in nine countries from May 21 to August 10, 2018, among 9,670 respondents. It also includes analysis from previous Pew Research Center surveys conducted in the United States in 2015, 2016 and 2017. Publics are generally more worried than hopeful about the prospect that robots and computers may one day be able to do much of the work done by humans today. Their greatest concern is that automation will make it harder for ordinary people to find jobs. More than eight-in-ten adults in Greece, Argentina, Brazil, South Africa and Canada voice such worries, and more than seven-in-ten in Hungary, Poland, Italy and Japan agree. Worries about shrinking the job market are widely shared among both men and women and across age groups. Japan and Brazil, however, stand out as countries where those ages 18 to 29 are significantly more worried than older generations about the impact of automation on employment. 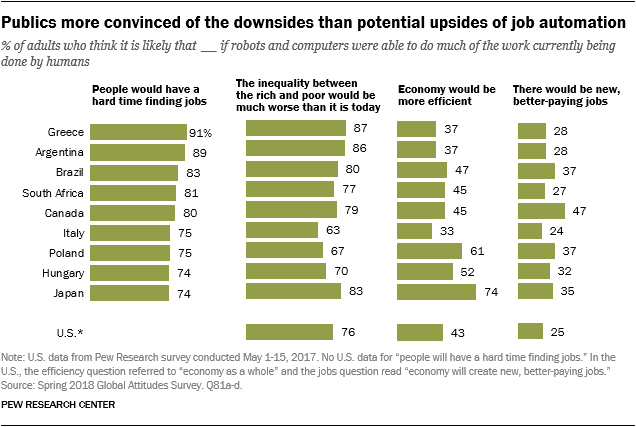 Many in the nations surveyed also believe that the greater use of robots and computers will worsen inequality between the rich and the poor. More than eight-in-ten in Greece, Argentina, Japan and Brazil express this view, as do more than seven-in-ten in Canada, South Africa, the U.S. and Hungary. Worsening inequality due to technological advances is a particular concern among the more highly educated in countries such as Japan, South Africa and Brazil. Along with concern about negative consequences, there is widespread skepticism about the potential economic benefits of automation. Only in Japan, Poland and Hungary does half or more of the public believe that automation will enable their economy to become more efficient. Older Canadians – those ages 50 and older – are particularly dubious of the purported efficiency gains from using more robots and computers. Women are especially skeptical in Canada, Japan, Argentina and Brazil, as are people with less than a college education in Greece, Italy and Japan. And less than half the publics surveyed believe that robots and computers doing much of the work currently done by humans would lead to new, better-paying jobs. In fact, only about a quarter of Americans and Italians and roughly a third of Japanese and Hungarians hold this view. Women are less hopeful than men in Canada, Japan and Brazil. And in Canada, Greece and Japan, those without a college education are less likely than the college-educated to say that automation will lead to new, better-paying jobs. In most nations, pessimism about the likelihood of high-quality new jobs is linked to views about the current state of the economy. For instance, 42% of Argentines who say their current national economy is in good shape believe automation will lead to new, better-paying jobs; among those who rate the current economy poorly, just 26% express this opinion. Who is responsible for making sure the workforce is prepared? Publics place responsibility for dealing with the evolving nature of work on a variety of institutions and actors. Government looms large in the minds of many. Nearly eight-in-ten Argentines say government has a lot of responsibility for ensuring that the nation’s workforce has the right skills and education to succeed in the future, and more than seven-in-ten hold this view in South Africa, Brazil, Greece and Italy. Only in the U.S. do fewer than half believe the government has a lot of responsibility for preparing the nation’s workforce. Government investment to help workers adapt to the new technological age varies greatly from country to country. Denmark, for instance, spends 3.22% of its gross domestic product on active and passive labor market policies, according to the OECD. Germany spends 1.45% and the United States 0.27%. Schools, according to most, also have a major role to play in preparing workers for the future. Majorities in every country surveyed except Japan believe the educational system has a lot of responsibility for ensuring that the workforce has the proper skills and education for the jobs of the future. This perspective is especially common in Argentina, South Africa and Brazil. Most also see a role for individuals. This is particularly true in the U.S, Argentina and Brazil, where more than seven-in-ten say individuals themselves have a lot of responsibility for making sure they are prepared for the future economy. Again, Japan – where just 39% express this opinion – is an outlier. Employers are seen as having somewhat less responsibility for making sure the workforce has the education and skills necessary for success. Still, roughly half or more believe employers have a lot of responsibility in Argentina, Brazil, South Africa, Hungary, Italy, the U.S., Canada and Greece.